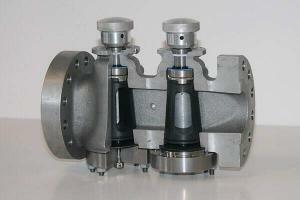 Valves, fully complying with the ASME and API codes . All Christensen double block and bleed valves are designed with the new CCR System – Christensen Cavity Relief System. The CCR System is patented appl. and is a special designed bore, going from the body sealing surface against the diaphragm to the post outside of each plug. All twin plug valves have the CCR System which avoids over-pressure in the cavity between the two plugs, if an emergency – with extreme high overheat, should occur.